A few months ago we officially announced to officially absorb the “Swap It HK” Facebook group, which at the time had 60,000 members. Over the past couple of months that group has undergone a re-branding to become the “Swapit HK” Facebook group. Growth of that Facebook has been phenomenal and a few weeks ago, it has surpassed the 100,000 members mark. We have intensified Swapit’s deep integration with Facebook to leverage on the social media network effects and ease of sharing. Today, many people are trading on our Swapit HK Facebook group, but a lot more people are actually trading on our Swapit mobile app. More and more people are joining the Swapit mobile app every day. Stats as of July 26th, 2017. While the Swapit HK Facebook group is a good place to start, everyone who wants to get more out of his trading experience, ends up using the Swapit mobile app. It allows posting on the Swapit app – reaching 200,000+ potential buyers – as well as easy sharing into our own Swapit HK Facebook group – reaching an additional 100,000 members – and on top of that, easy sharing into a number of other buy & sell groups on Facebook – reaching more than 700,000 of their members. To sum it up: Using the Swapit mobile app is the most efficient way to list your items and close a sale. We are proud to announce that the largest Hong Kong-based English-speaking buy & sell group on Facebook “Swap It HK” has officially joined forces with Swapit. This now extends Swapit’s reach of customer base by 60,000 instantly. The Facebook has been re-branded to “Swapit HK” now. From the onset, Facebook groups have been our inspiration for Swapit. The idea behind Swapit came about when we ourselves realized that trading through Facebook groups is actually not that easy. Yet, many people keep doing it for various reasons. We’ve been talking to a lot of those users. Many of which are users of our Swapit mobile app, but we’ve also been talking to many people on Facebook who use Facebook groups for trading. Most of them like Facebook groups, because all of their friends and friends of friends are on Facebook. So they keep using Facebook groups despite all the many downfalls and disadvantages they have (poor discovery, bad communication, no location, etc) – just go to one of my pitches and I can talk for hours on that topic. We recognize Facebook as a great social media, which most people in the world would not want to miss. We know people love to hang out on Facebook A LOT every day and we know they will continue to interact with their friends and family on Facebook. Recently, people are more and more communicating with brands and shops on Facebook too. It was a natural step for Swapit to embrace such already established behavior of our users and provide more value to them. Very early on, we started integrating Swapit with Facebook, which makes it very easy to share any item you post on Swapit, with your friends on Facebook, and also to share that into certain Buy & Sell Facebook groups. Stats as of December 9th, 2016. The Facebook group is by far not growing as fast our Swapit marketplace in terms of members or how we call them “registered traders”. However, their smaller user base seems to be quite active and both sides will benefit from a deeper integration. We’re working hard at Swapit to make our mobile marketplace better for everyone. Among many others, this includes Facebook users as well, of course. We are actively engaging with that community on Facebook and are collecting a lot of feedback. Based on that, we’ve already implemented many changes to our Swapit mobile apps to ensure a smooth transition of such Facebook group members to mobile app users. We are absolutely dedicated to creating the best mobile marketplace, which offers the best tools, best user experience and best social media integration. We are working hard on convincing each every of those group members that our Swapit mobile marketplace is an extended version of their Facebook group with a lot more benefits for buyers and sellers. So we continue to extend our integration and work together for a better future for all of us. So stay tuned and make sure you’ve got Swapit installed on your Android phone/tablet or iPhone. By the way, we will upload new Swapit app releases today. So more features and better integration is coming your way! Swapit just got updated with incredible sharing features. Swapit has always had a tight integration into Facebook and now we’ve just lifted that to the next level. After posting an item for sale (or for free), you can easily share your item on Facebook. It only takes the flick of a button and your item will reach up to 710,000 people in various buy and sell Facebook groups. Besides our loyal Swapit community of now 114,000 enthusiastic traders, we now increase your potential reach by 6-fold. Of course, this feature is available to all of our users. This includes all of our great users who are on a free account right now, but also our Premium subscribers. After our last Swapit beta 8, we silently launched a beta 8.1 right after that. Then we had planned to launch beta 8.2 shortly after that as well, but the changes got so big, so significant, that it became our official Swapit beta 9. Swapit beta 9 can now be downloaded from Google Play. Just go to http://get.swapit.la and get it now! So what’s new in our beta 9? Let me get right to that. With this beta, we are introducing 18 new categories and are slightly re-organizing our existing ones. We are also introducing the concept of premium categories on top of our normal categories. In total, we are now offering 22 different categories, you can post your stuff in, or you can filter by, when searching for items. While it sounds rather simple to add new categories, we actually had to deal with many forward thinking approaches. The future is bright, it comes with many opportunities and Swapit is ready for change — big change! Chinese 中文 Language Support 啦! 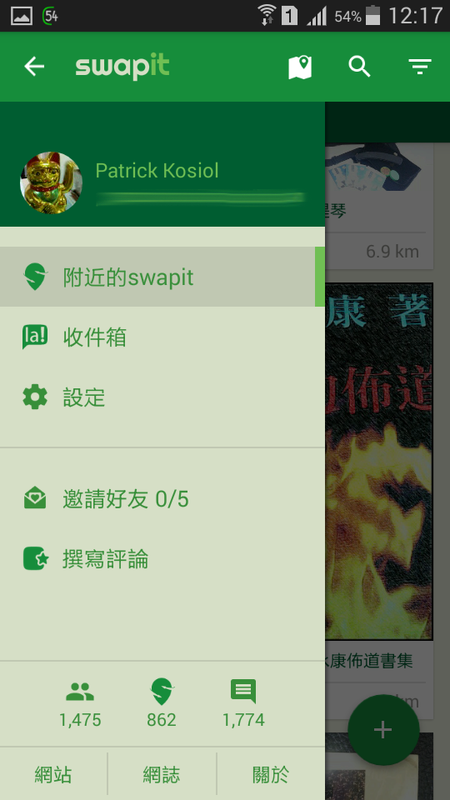 Since beta 1 of Swapit it was possible to post items with Chinese title and description. Swapit was built from the ground-up with multi-language support. This does not just include Chinese, by the way. Now, we have finally gotten around to translate the app itself into Chinese. We have seen a lot interest from the local Chinese community and now it is time to cater to all of you as well. We are sure you will love it. In our last beta we introduced easy sharing of items to your Facebook timeline. Now, we added capabilities to share your items into Facebook groups. At the moment, we are working with three groups that have over 20,000 members locally here in Hong Kong, which expands the reach of potential buyers dramatically. We will be adding more groups soon to increase the potential reach even more. There were also several minor improvements to the user interface, layouts and performance, as well as bug fixes, which made its way into this beta 9. More improvements are still to come. Stay tuned and do reach out to us, should you have suggestions. We’d love to hear from you! Want to check out Swapit? Go to http://get.swapit.la and download it for free.